The Kate & Allie TV show was a 30 minute comedy series on CBS about two females who had been best friends since high school. They both found themselves divorced with children, so they decided to move in together and raise their kids together. Kate was kind of a "free soul" and Allie was very conservative. Their conflicting personalities and the typical problems associated with raising kids provided lots of plot opportunities for a family comedy series. By: "John Lefler and Ralph Schuckett"
and things start looking fine. Kate & Allie was originally only supposed to be a mid-season relacement series. CBS only ordered six episodes to be produced, but when the very first episode was the fourth most watched television program of the week, they quickly ordered another full season! Kate & Allie was loved by audiences and critics alike. It ranked among the top twenty shows until its final (disatrous) season. The two leading ladies also got their share of accolades. Jane Curtin won two Emmys for "Best Actress in a Comedy Series" and Susan Saint James got nominated three times in that same category. When the second season of Kate & Allie began, CBS had constructed a pretty great Monday night of television entertainment. "Scarecrow & Mrs. King" came on right before "Kate & Allie". After that they aired, "Newhart", and then another series about strong women titled, "Cagney & Lacey". Lifestyles were changing throughout the 1970s and early 1980s. There were more and more women willing to become independent and leave a bad marriage. 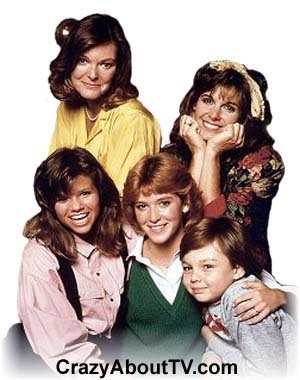 Part of Kate & Allie's attraction was that it showed women on television who were successfully raising their kids despite financial and other obstacles and without the need to remain in an unworkable relationship. Unfortunately, Kate & Allie's "new" lifestyle was not accepted well by everyone. Their were rumors that they were lesbians and those rumors were widespread! The show handled that by showing Kate & Allie entering seperate bedrooms at the end of each episode. They also filmed an episode where Kate & Allie pretended to be lesbians to avoid a rent increase. At the start of Kate & Allie, Kate went out to earn the living as a travel agent and Allie performed the role of stay-at-home mom for all the kids. In the fifth season, they started up a catering business and shared the "mom" duties. Actress Andrea Martin appeared on two episodes of Kate & Allie as a cable TV station manager. Those episodes got higher than normal ratings so CBS decided to make a "TV spin-off series" based on her character. The series was titled, "Roxie" and it lasted a whole two episodes! Susan Saint James got pregnant during the second season. This presented a problem for the writers as her character was single and CBS did not want Kate to get pregnant out of wedlock. They handled the problem by having Kate stand behind something or, for a while, by being in recovery (under a blanket) from a broken leg. Audiences did she Kate pregnant on one episode, however, where they "flashed-back" to a time where she was pregnant with her daughter. At the end of the fifth season, Allie accepted a marriage proposal. When season six rolled around, she got married and her and her husband moved into a new apartment and Kate moved in with them. The writers tried to prevent the loss of the "two gals against the world" aspect from the show by having Allie's husband commute to work from New York to Washington D.C. but the whole mood of the series changed anyway as Allie didn't need the support from Kate like before. The ratings fell off and CBS canceled the series. By the way, if you check out the episode list below, you'll notice that the final season didn't begin until the middle of December. That had nothing to do with ratings or with the cancellation. There was a writers' strike in 1988 which delayed the writing of scripts. If you never watched Kate & Allie, you might still know Susan St. James from her starring roles on, "The Name of the Game" or "McMillan & Wife". Jane Curtin is probably best known today for her roles on "Saturday Night Live" and "3rd Rock From the Sun". Thank you for visiting our Kate & Allie TV show page!